Jacques Barzun is a towering scholarly intellect, a perceptive and incisive historian as well as one of the most graceful and witty writers of Twentieth Century America. Like Vladimir Nabakov, Barzun is not a native English speaker (he was born in France in 1907 and came to America in 1920 after the Great War had ravaged of his native land) yet he became one of the grand masters of English prose. To read Barzun is a refreshing joy and fortunately, there is much to read. He is the author of Race: A Study in Superstition, Of Human Freedom; Darwin, Marx, Wagner; Romanticism and the Modern Ego, Teacher in America, Berlioz and the Romantic Century, The Energies of Art, Music in American Life, The Modern Researcher (with Henry F. Graff), God’s Country and Mine, A Catalogue of Crime (with Wendell Hertig Taylor), The House of Intellect, Science: The Glorious Entertainment, The American University, Clio and the Doctors, Simple and Direct, A Stroll with William James, An Essay of French Verse for Readers of English Poetry, From Dawn to Decadence, and Sidelights on Opera at Glimmerglass along with various collections such as the indispensable, Jacques Barzun Reader, also compiled by his biographer Michael Murray. 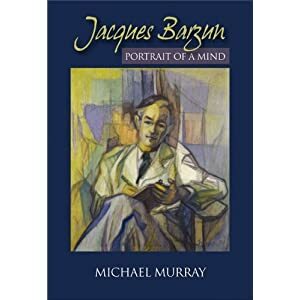 In Jacques Barzun: Portrait of a Mind, Murray has written what any devotee of Barzun’s work would like to read. The subtitle, Portrait of a Mind, conveys its intention exactly. If you’re looking of family pictures or tidbits about Barzun’s private life, you won’t find it here. Murray is true to his task and one comes away with a good understanding of Barzun’s innate genius (though he would deny that appellation) and the growth and flowering of his intellectual life. This ideal world was shattered by the Great War which plunged Barzun into a deep depression even though he was very young at the time. Tellingly, he only emerged by reading Hamlet at age ten which convinced him of the necessity of accepting the “slings and arrows of outrageous fortune,” accepting life as it is – which gives one an indication of the depth of his mind. He later taught himself English by reading Jonathan Swift and Washington Irving. His parents brought him to America in 1920 and at the age of 16, Barzun entered Columbia College in New York and graduated Phi Beta Kappa and Valedictorian in the class of ‘27. He began his career teaching there just a few months later as financial pressures were heavy. An unscrupulous money manager had absconded with the family funds and Barzun had the additional burden of having to help provide for his parents, a burden he took without complaint. Another indication of his character is the kind solicitude he showed his boyhood teacher, a certain Miss Swope, to whom he repaid a sum she had lent to his father (money which had allowed his entry to Columbia) and which Jacques discovered was un-repaid many years later. He dedicated his first book, The French Race, to her. The following video was produced in 2007 when the graduates of Columbia University presented Barzun with its Great Teacher Award. Barzun remained at Columbia specializing in cultural history and eventually became an administrator, Dean of Faculties and Provost, until his retirement in 1975. It was long after his retirement that he wrote what are perhaps his two greatest masterpieces, the bestselling From Dawn to Decadence (2000) a sweeping historical work covering the Reformation to the present day and A Stroll with William James (2002). Throughout his long career, Barzun was concerned with placing men in their proper historical perspective and with giving them their proper historic weight. Throughout his work, Barzun goes about correcting the popular misapprehension of those same figures with unmatched skill and his distinctive and graceful style. He also has a gift for highlighting areas or qualities a particular writer may not be particularly known for: Dorothy Sayers on theology, Oscar Wilde’s criticism, Walter Bagehot’s historical work. His short essay on Abraham Lincoln as an artist contained in A Jacques Barzun Reader is a masterpiece, showcasing his easy-seeming style which, while compact, is never cramped or rushed. All aspiring young writers should be encouraged to read Barzun. He also raised the reputations of those who worked against the grain of their time such as William Hazlitt, Samuel Butler, and John Jay Chapman while lowering the reputations of those who, in Barzun’s estimation, were unoriginal and simply synthesized the zeitgeist and received exaggerated reputations as a result, such as Darwin, Wagner and Marx. Barzun also worked tirelessly to rescue or correct the reputations of those he considered misunderstood such as Hector Berlioz, William James and even George Bernard Shaw. Barzun was deeply interested in music and theater all his life. His subjects are invariably treated with sensitivity and depth, thus Barzun conveys a real sense of history for the reader. While deeply concerned with ideas and their consequences, he is ever mindful that ideas originate and are shaped through time by human beings of flesh and blood whose individual personalities and temperaments thus mark the course of history. Of Martin Luther, Barzun writes: “His achievement puts him in the class of great defiers and self-made rulers – Caesar, Cromwell, Napoleon, Bismarck – and like them he is only half understood if one ignores his imagination and sensibility.”1 Elsewhere he writes, “Conventional knowledge is usually based on some evident truth, above which is reared a superstructure of misunderstanding and fallacy.”2 As way of illustration, “[M]ost Americans believe that for fifty years Lincoln’s connection with the literary art was to tell racy stories. Then, suddenly, on a train journey to Gettysburg he wrote a masterpiece.”3 And so it goes, over a wide range of historical events and personalities. Barzun’s perspective is always fresh and surprising. Yes, he’d be utterly indifferent to them all. But I wouldn’t be, nor would you. I’d like to envelope my letters with a tutelary touch of Barzun in its franking, and would willingly kiss the lips of that unacquainted change, and find it fitting that American schoolchildren should listen in the serried ranks of their classroom desks to that presidential decree read out by the teacher, so that as they grow up some of them will find that name recallable, and will indeed recall it, and then in some cases be prompted to read the books by, and learn to appreciate, and to heed, that clear-headed and eloquent teacher and scholar, that phenomenon, Jacques Barzun. Visit Leo Wong's excellent site, the Jacques Barzun Centennial for more. To comment on this book review, please click here. To help New English Review continue to publish interesting reviews like this one, please click here.